The McCleary decision upped the ante for K-12 public education. This budget cycle, the Legislature needs to prioritize higher education. In January, Washington lawmakers will return to Olympia to write the state’s next two-year budget. As they sharpen their pencils to write the spending plan, hundreds of thousands of students will be sharpening their minds in the classrooms of community and technical colleges and universities. These students are studying hard, taking out loans, and juggling family and work obligations to build a good life and make a solid living. They — and the employers who hire them — need the Legislature’s support to keep education beyond high school accessible, affordable and outstanding. Study after study shows that for people to land well-paying jobs, they need education beyond high school — whether it means a certificate, apprenticeship, two-year degree or four-year degree. A new generation of jobs — fueled by automation, technology and scientific advances — demands higher levels of skills and knowledge. Even traditional jobs are requiring higher levels of math, analysis, problem solving and technology. Current employees need to refresh and update skills as much as college students need to learn them, yet today just 52 percent of Washington adults have moved past a high-school diploma. That’s why increasing investments in our institutions of public higher education must be a priority when the Legislature convenes in January. The timing is critical. The Washington Roundtable, a nonprofit organization of senior executives from major employers, reports that more than half of the 740,000 job openings predicted by 2021 will require education beyond high school. In June, the Roundtable cautioned that our state isn’t moving fast enough to prepare students to land these jobs. Meanwhile, Boeing continues to study whether to launch a new midmarket airplane. If Boeing decides to move forward with the project, Washington state will face fierce competition to land the new business here. We’ll need to prove we offer the range of talent Boeing needs to launch its new aircraft, from mechanical, electrical and software engineers to front-line assemblers and mechanics. Reinvesting in our universities and community and technical colleges will open the doors wider for Washingtonians to get well-paying jobs and become well-rounded members of strong communities. It will give employers the chance to fill Washington jobs with Washington talent rather than relocating elsewhere or importing so much of their talent. Our state’s 34 community and technical colleges and six public universities and colleges — University of Washington, Washington State University, Western, Central, Eastern and Evergreen — already provide much-needed pathways to good jobs. We train surgeons and nurses, CPAs and bookkeepers, senior executives and front-line workers, engineers and machinists. Our graduates have the passion and talent to fill every level of position for every type of employer, big or small, in cities and towns across the state. Thanks to strong transfer agreements, students can smoothly transfer from community and technical colleges to universities. Many universities have established centers right next door to community and technical colleges. For many years, the Legislature has been consumed with the task of meeting a Supreme Court mandate to fund K-12 schools, the “McCleary decision.” In June, the Supreme Court ruled that the Legislature had met its mandate. After years of debate and billions in extra investments in K-12 schools, the air has finally cleared to focus on the next step for students: higher education. McCleary investments will translate into more high-school students who are better prepared for college-level work. We need to make sure they get to college, graduate and land on their feet in the job market. Recently, Gov. Jay Inslee’s Career Connect Washington Task Force unveiled a plan to expand work-based learning opportunities so students get real-world experience before graduating. This makes the case for higher-education funding even stronger. Writing a budget is a tough task. The Legislature will face many other pressing issues, from homelessness to mental health to addiction. The solutions to many of these issues are sitting in the seats of our colleges and universities. Our graduates are more likely to have economic security and less likely to need social services. They build strong communities and help solve the tough problems facing our state. As fans anticipated the Apple Cup, WSU’s marching band played UW’s fight song as a touching tribute to the Husky Marching Band, which was unable to attend the game after one of its buses rolled over on the way to Eastern Washington. The Thanksgiving weekend’s events served as a reminder about our shared connection and commitment to students and their higher-education experience being bigger than a game. Similarly, our colleges and universities have joined forces in a campaign to send a message to all students and their parents in Washington: “Yes, it’s possible.” More information about the campaign can be found at possiblewa.org. 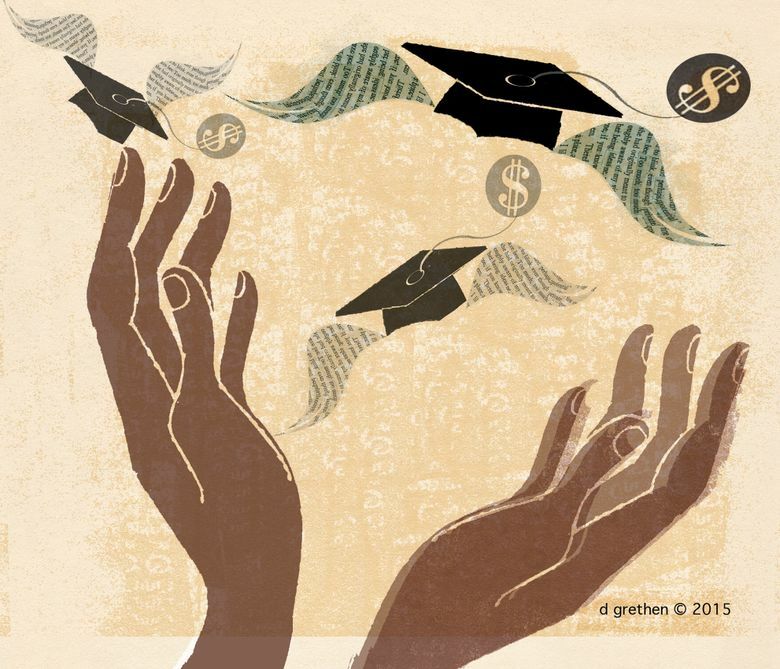 Yes, higher education is achievable and affordable for Washington students. Yes, no matter where students are, there’s a path forward. Now it’s time for budget writers to also say “yes, it’s possible” — it’s possible to prioritize higher education. The Washington Roundtable coined a catchy and accurate phrase: “A Credential is Essential.” For the students at our community and technical colleges and universities, and the employers who count on them, we urge the Legislature to take this lesson to heart. Kirk Schulz is president of Washington State University. Jan Yoshiwara is executive director of the Washington State Board for Community and Technical Colleges.